Imaging growing dendrites using short intervals ranging from seconds to hours reveals a remarkable level of motility present in immature dendritic arbors. 10 |im), highly motile processes are actin-rich and are therefore referred to as dendritic filopodia13'19'27'28. There appear to be at least three distinct populations of dendritic filopodia with different growth behaviors: filopodia on developing dendrites extending from growth cones and shafts, and filopodia on mature dendrites. Filopodia of mature neurons may be associated with synaptogenesis and spine formation29-31, but not with dendrite growth since they do not give rise to new branches. In early periods of neuronal development during the most extensive period of dendrite growth, filopodia are not associated with spines. The height of expression of filopodia associated with dendrite growth occurs at developmental stages well before the appearance of spines in spiny neurons, and they are similarly found expressed in nonspiny neurons14,32-36. Portera-Cailliau and colleagues imaged dendritic filopodial motility in dye-filled pyramidal neurons within acute cortical slices derived from rat pups 0 to 12 days old13. Using rapid, 30 s-interval time-lapse imaging, they found a maturational change in occurrence of filopodial, with the height of expression around postnatal day 5 (one week before spines appear in these neurons). They observed that filopodia crowning dendritic growth cones behaved differently than shaft filopodia in that they are longer, more motile, have shorter life-times, and are insensitive to activity. Figure 20.2. Short-Interval In Vivo Time-Lapse Imaging of a Portion of the Dendritic Arbor of a Single Developing Xenopus Tectal Neuron Demonstrates the Rapid Motility and Turnover of Dendritic Filopodia. Pictures were taken at 2-min intervals and arrows point to three sites of dramatic filopodial motility. The surprising finding from short-interval imaging of dendrite growth is that the great majority of newly extended filopodia retract over seconds or minutes. Cortical pyramidal neurons imaged in acute slices from postnatal day 2 to 3 showed a remarkable turnover rate calculated to result in extension and retraction of approximately 50,000 shaft filopodia in a single dendritic arbor in 1 day. 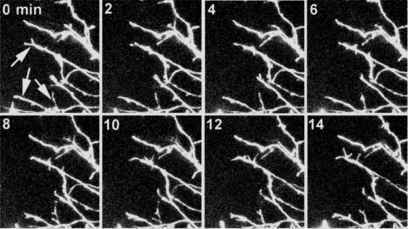 Even with this high turnover, dendritic arbors rapidly grow in total branch length and branch number through both elongation of existing branches and addition and maintaining new branches12,25. A small fraction of the pool of newly added filopodia stabilize and grow to become persistent components of the dendritic arbor, and subsequently support further extension of additional filopodia. 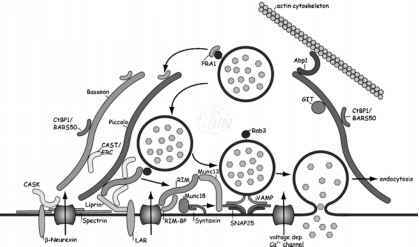 The purpose of such high turnover of dendritic filopodia remains unclear, but it may involve sampling the environment for growth-promoting factors, to guide growth, and/or to establish correct synapses. Recent work, however, sheds some light on factors that promote stabilization of the few filopodia that contribute to persistent dendrite growth.